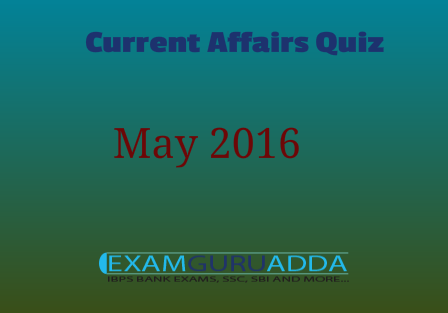 Dear Readers Examguruadda.in presents Current Affairs quiz of 13th May and 14th May 2016 that cover important current affair events. Current Affairs quiz prepared according to the latest Bank, SSC and other competitive exams. 1. World's biggest refugee camp was located in which country ? 2. Which Bank has launched country’s first contactless business credit card in association with Jet Airways for small and mid-sized enterprises (SMEs) ? 3. NITI Aayog to replace 5-year plans with ........ vision document? 4. Who has been re-appointed ICC (International Cricket Council) Cricket Committee chairman for a second term ? 5. United States has activated a land-based missile defence station (Aegis Ashore Missile Defence System) recently in which country ? 6. Who was named as first female secretary general of FIFA? 7. Who is the author of the book “Chaos and Caliphate: Jihadis and the West in the Struggle for the Middle East”? 8. Who has been appointed as the Deputy Comptroller and Auditor General ( CAG)? 9. Which denomination banknotes with insert ‘R’ will be issued by the Reserve Bank of India ( RBI)? 10. Which city has been named as the world’s most polluted city, as per recently released urban air quality database of World Health Organization (WHO)?